At some point, your vehicle will leave you stranded due to mechanical breakdowns, or accident, and you will have to need professional towing and roadside assistance service assistance in an immediate manner to be rescued. Doing it yourself or highly help from a friend is never a good idea because it required special equipment and skills to recover the problem without causing any damaged. When problems are running high with your vehicle, you may need quality 24/7 towing, Roadside Assistance Services, blocked driveway towing, lockout service, fuel refilling and more that are reputed in the background and done work professionally at an affordable cost. Ritewaytowingnyc is the professional towing company in NYC and provides you accurate towing solutions just in one call. We help you by giving 24 Hours Roadside Assistance in New York and fixed the problem immediately in your region. 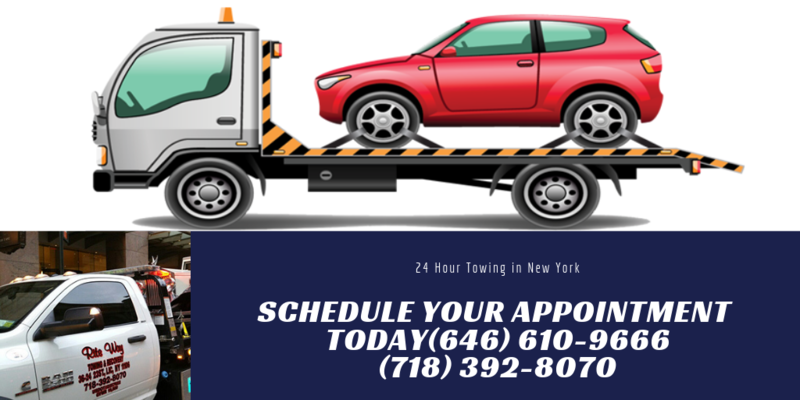 There are many benefits you likely receive through our 24 Hour Towing in New York and other vehicle services through professional technicians. It’s the best options to maintain your vehicle performance perfect and away from the hassle wherever you drive. You can determine our services for the queen, Manhattan and more long-distance areas of NYC and rectify your situation quickly. What Professional Vehicle services we offer you? Roadside Assistance, towing and more services are beneficial to attempt for sorting the minor mechanical problems and other vehicle adjustments to make drivable again. During the driving, many things happen that can go with your car wrong and the professional services restore in minutes at the roadside, so you can safely drive again. We provide emergency roadside assistance service NYC and several more to your rescue when your car breaks down in the middle of the journey and host several benefits without taking long hours. Our professionals will come with the needed equipment to get your vehicle out from the current location and you safely drive again. You will need in one of the following professional services that beneficial for you and make your vehicle drivable again. Read out each one thoroughly to know about the benefit and need of the servicer quickly. If you found yourself in the middle of the road or in the high at midnight, you have needed to call expert technicians to safely move again for your destination. 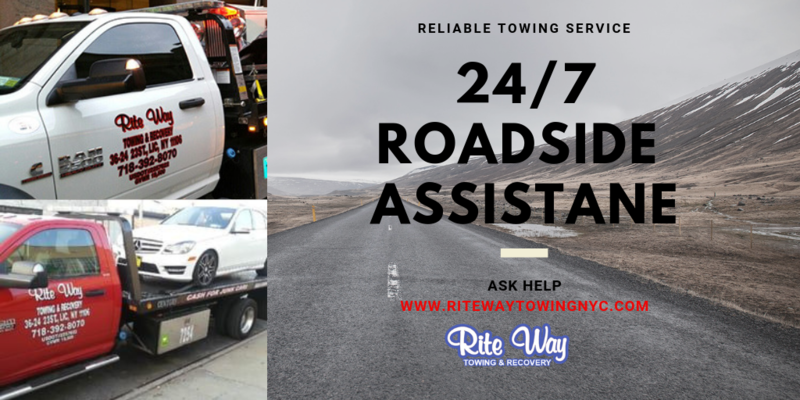 Ritewaytowingnyc is the best roadside service provider and tow your any type of vehicle in the mentioned NYC areas and won’t leave you stranded, and just charge affordable cost against service. Our professional roadside assistance NYC experts reach to your destination in no time and control additional damages on the spot. If you wish to take care of your vehicle in a proper way, gets our 24 hour towing service at the reasonable cost. If your car battery fails and stuck anywhere roadside, you have needed to get jumpstart service by the qualified technicians. We provide you complete jumpstart service in minutes and help you in this scenario in quick manners. We help you by giving a quick jumpstart to the vehicle battery through equipment, but if the problem is serious replace from the new one that you safely moved from the location. It is the best professional NYC 24-hour towing services and covered the breakdown situation on the spot. Visit our website and give us a call to instant assistance right away! Another problem in your vehicle occurs if you accidentally left your keys inside or stolen at the roadside anywhere. Our qualified service experts arrived in just one call and help you by unlocking your car with a new pair of keys instantly. You have just bear the cost of keys and some services charges to get rid of the problem at the roadside. Our professionals will assist you by giving Lockout Service Queens NY, Manhattan, and more surrounding areas and take care of your vehicle properly. Call us and get the assistance pay paying by paying affordable charges today. Get the professional help to make your vehicle running smoothly and proper way! If your vehicle runs out of gas or fuel during traveling in NYC areas gets our assistance we delivered the fuel on your current location. Our emergency roadside assistance service NY available 24/7 to resolve your vehicle trouble in any situation and make it less stress fuel. Through towing service, we safely leave your nearest gas station, so you can get back on the road in a few minutes. So, if you are facing such circumstances at the roadside, get 24 Hour NYC Towing Services and more from our professionals and immediately resolve the problem. Anytime when you stuck because of vehicle issues, give us a call at (646) 610-9666 or (718) 392-8070 for anywhere in the mentioned NYC areas. If you need a service, call Rite way towing today and get back on the road right away.